If you’ve ever met me, you know that I love the water. I’ve always been fascinated with it. The consistency of it. The way in which our bodies interact with it. I have always lived by the water and it has always provided me with the space I need. Even when I lived in Chicago, the lakefront was this giant expanse that gave me some place to just relax even if the big city was right behind me. As a coach I think that it is vital to be knowledgeable in swimming, both as a stand alone sport, but also in triathlon. 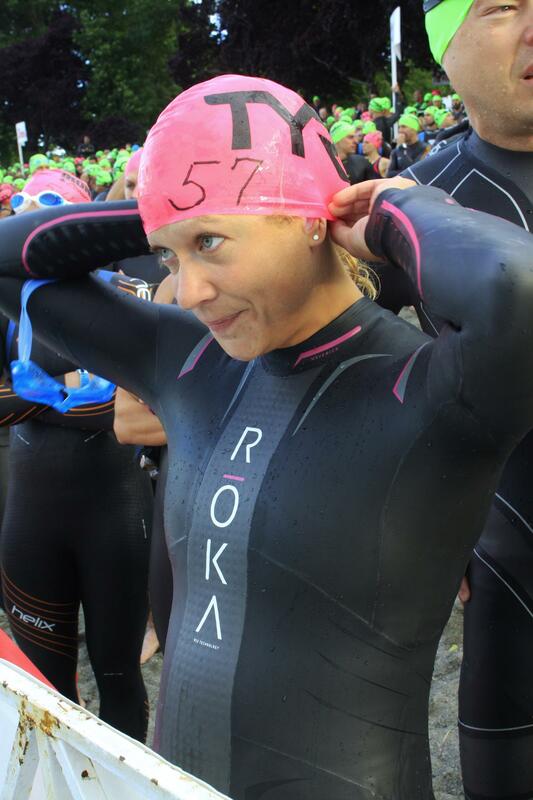 This has made the partnership announcement of BASE Tri Fitness and ROKA Sports all the more awesome! Last year I needed to replace the wetsuit that I had raced all of my previous wetsuit legal Ironman races in. I wasn’t sure what to expect but I did my research and I came upon ROKA. Not only was I impressed with the customer service, but I felt part of their “team” right away. What happened next blew my mind. I went for a swim in my Maverick Pro. There is nothing to describe that first swim as anything but short of effortless. Sure I could feel the difference in the materials used before I got in the water but it was such a great feeling to just feel like I was slicing through the water – I used the word before but its the only one I can think of – effortlessly. Their motto – #findfaster – couldn’t have said it better. Ever since that first swim my swim times have been significantly faster than previous races (at IMCDA I raced 5 minutes faster in the swim in HARDER conditions). When I look to partner with companies, I have to really believe in their product. I don’t just seek ‘deals’ or partnerships for the sake of saying ‘oh hey look we have so and so as our sponsor’. It’s not about that to me. I want my athletes to be able to have access to some of the best equipment possible. It’s a privilege that our team is made up of talented athletes but also really wonderful athletes who are ambassadors of the sport, so why work with a company unless they echo our passion and pursuit of excellence? Cheers to a great new partnership ROKA & BASE. I can’t wait to see how things turn out this year – and I can’t wait for all of our athletes to #findfaster. Blue Boxer Day: Prostate Cancer Be Damned!